The dangers of vaccinations to your child's long term health prospects and longevity itself far outweigh any potential benefits touted by the pharmaceutical industry for vaccines. 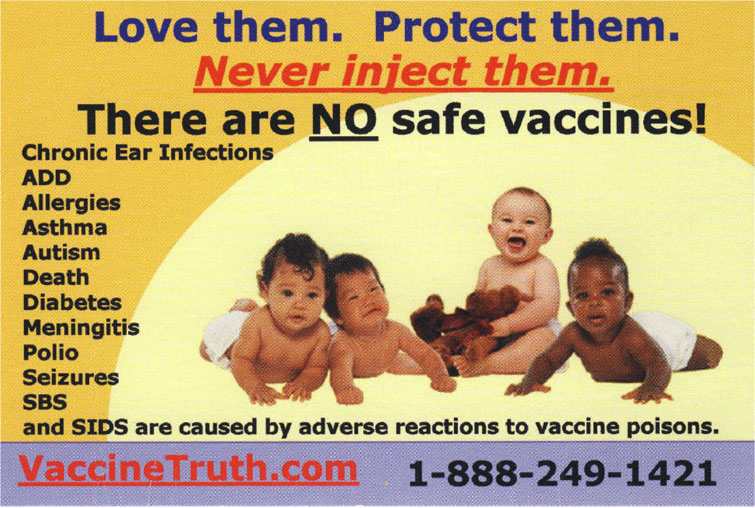 The LIES and misinformation about vaccine benefits ("safe and effective") from the pharmaceutical drug industry and their promoters in state and federal "health" agencies, in radio, on TV, in print, and their cheerleaders in organized medicine is voluminous and smothering, characterizing anyone (regardless of academic or professional credentials) who challenges their party line dogma as "crazy," or uneducated, or unscientific, or "quacks," or dilletantes, or paranoid & delusional -- any and every derogatory characterization in the book, except legitimate critics (who they will NEVER debate in a public forum - because they know they would lose). Don't allow your child to go on the chopping block for these Liars and their profit margins. They aren't working for you, they're servants of the Illuminati and the Illuminati has a surreptitious population reduction agenda in place. Tell the doctor, tell the clinic, tell the school, tell the nurse, tell the employer, tell the government bureaucrats, tell the health department, or anybody else who is trying to force you or your kids to take vaccines against your will...."because you must take them", Tell them... NO. No matter WHAT they say or threaten you with, tell them ....NO. Update July 22, 2015: The most powerful, and convincing video lectures I've seen to date explaining how and why vaccines damage the body are contained in a 3 volume DVD series of slide lectures by Dr. Andrew Moulden MD PhD, titled Tolerance Lost, which is now available free online. All 3 volumes of the video series can be found at the link below, along with a brilliant introductory article posted by Dr. Moulden on August 3, 2009 explaining how vaccines create blockage and "sludging" of blood flow into the miles of tiny, microscopic sized capillary networks that deliver oxygen to the brain, neurons, and all functioning cells of the human body. One of the best documentaries ever produced on the devastating and life-long toll inflicted upon society by the pharmaceutical/vaccine industry and their cohorts in Establishment Medicine, government and media. The Importance and Value of Childhood Diseases (Oct. 20, 2016) ...etc. While Media & Big Medicine Tell Us Vaccines Are Safe, A Plethora of Scientific Studies Prove Otherwise (March 3, 2015) ...etc. HPV Vaccines: Unnecessary and Lethal by Gary Null, Ph.D. and Richard Gale (April 8, 2014) ...etc. Eugenics Today: How Vaccines Are Used to Sterilize the Masses (Jan. 14, 2014) ...etc. When, oh When Is The World Going to Wake Up to the Dangers & Stupidity of Getting Vaccinated ~ for Anything? (Sep 3, 2013) ...etc. ALL the Vaccines Are Contaminated - Every Last One of Them (Nov. 29, 2011) ...etc. The Fall & Winter of 2009 saw an unprecedented propaganda campaign, conducted worldwide, spearheaded by the Rockefeller-founded World Health Organization (WHO) in league with pharmaceutical giants and the governments of America and Great Britain principally, to convince all of us that we were in the grips of a dangerous "Swine Flu Pandemic" that would supposedly kill millions if we didn't rush out and line up for our Swine Flu vaccination. Many people fell for that deceitful campaign and some paid the ultimate price for their misplaced trust and gullibility. We came very close to having mandatory vaccination forced upon us, or face the possibility of being quarantined in our home or in a detention camp. 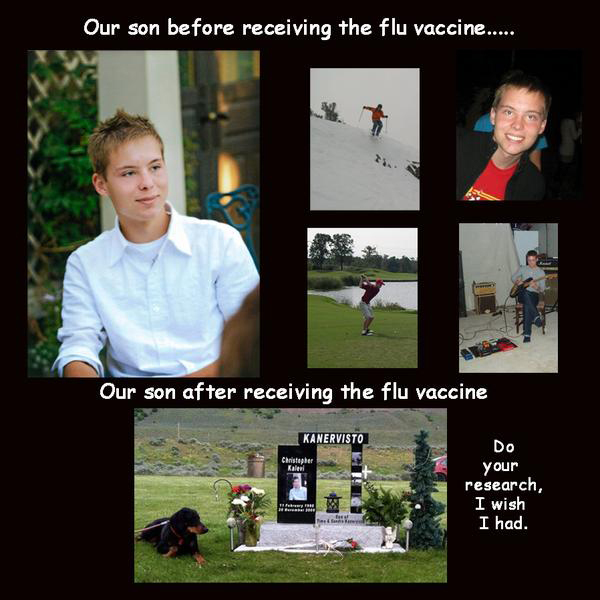 This year, Fall/Winter of 2010. the Swine Flu propaganda is more muted and less strident, but the same lies continue to be repeated by mainstream media, radio, and web sites. The lies foisted by the above-named criminal groups are now known to a much wider public population than was the case in Spring and Summer of 2009, so hopefully the specter of a FORCED vaccination scenario will not arise again soon, but beware that any attempt to force vaccines upon you, without your consent, can only come about through false flag manipulation and deceit. NEVER acquiesce to vaccination against your will. Modern vaccines are intended to destroy life, not preserve life. In the USA, 1 in every 50 children is now autistic. In this award-winning documentary, investigative film maker Gary Null looks at the causes of the autism epidemic and reports on children's recovery from autism. Autism is 'Truly Curable' Using MMS: Kerri Riverra Explains at the 2012 Autism One Confernce (Video) August 21, 2013 ...etc. The government is planning on forced vaccinations for Swine Flu this Fall. This is a very serious and grave concern for all Americans and people around the world who will be confronted with this issue. You must NOT take these vaccines if you expect to live a normal life span! The purpose behind these vaccinations is population reduction--genocide! Do not believe government PROPAGANDA and lies! Are vaccines safe? Did they truly cause a decline in disease in the United States and elsewhere? If not, what did? This site is dedicated to those who have suffered needlessly. Extensive new web site with loads of info on the dangers that early vaccination present to babies and very young children. Well worth the time. .
VRAN is Canada’s premier group to advocate for informed choice in making vaccination decisions. Formed in 1992, it was born of the committee that ten years previous won an exemption of conscience from vaccines required by the Ontario ‘Immunization of School Pupils Act’. VRAN recommends consumers beware of flu shot propaganda; we hold individuals and organizations accountable for misleading information about influenza and its vaccine. Welcome to the Thinktwice Global Vaccine Institute website. We offer an extensive selection of uncensored information on childhood shots and other immunizations. Because this is such an important topic, we believe that parents are entitled to a full disclosure of all pertinent data, and the freedom to choose whether or not to vaccinate their children. I did a search under "vaccine dangers" at Gary Null's web site and came up with over 200 articles. An international movement of parent volunters helping more than 10,000 children begin biomedical treatment. Our children are experiencing epidemics of ADD/ADHD, Asperger's, PDD-NOS, and Autism. We believe these neurological disorders ("NDs") are environmental illnesses caused by an overload of heavy metals, live viruses, and bacteria. Proper treatment of our children, known as "biomedical intervention", is leading to recovery for thousands. The cause of this epidemic of NDs is extremely controversial. We believe the primary causes include the tripling of vaccines given to children in the last 15 years (mercury, aluminum and live viruses); maternal toxic load and prenatal vaccines; heavy metals like mercury in our air, water, and food; and the overuse of antibiotics. Generation Rescue is a parent-founded, parent-funded, and parent-led organization of more than 350 families. Our mission is to share the truth with parents about the cause of their child's NDs so they can focus on treatment. The Toxic Payload in Vaccines (Oct. 17, 2016) ...etc. Autism & Vaccines: A New Look At An Old Story (April 19, 2015) ...etc. Four Thousand Two Hundred and Fifty Percent (4,250%) Increase in Fetal Deaths Following Flu Shot Vaccination to Pregnant Women (March 20, 2015) ...etc. Population Control and The U.N.
Who Decides What Drugs Are Forced on Children? © Copyright 2002-2013 Educate-Yourself.org All Rights Reserved.